Daniel Crouch Rare Books will exhibit at the 31st edition of TEFAF Maastricht, with a collection of maps, books and scientific instruments that emphasize the links between cartography, navigation and astronomy during the Age of Discovery. This March Daniel Crouch Rare Books will explore the mapping of heaven and earth in the Age of Discovery. Exploration in this period did not simply expand European territorial knowledge, but in turn spurred improvements in scientific instruments and in astronomical observation. The collection of six Ptolemy atlases provide a perfect example: although they are groundbreaking examples of cartography, containing the first available printed maps of America and Japan, they are based on astronomical calculations made by an ancient Greek cartographer. The calculations needed for cartography produced both practical and fantastic results. Day to day navigation is represented by the sextant used by the navigator George Vancouver (£75,000), whose name lives on in the city in Canada. Vancouver accompanied Captain James Cook on his second and third voyages of Pacific exploration, and was one of the men who recovered Cook’s body after he was killed in a confrontation with locals in Hawaii. At the opposite end of the scale is an extraordinary, and possibly unique instrument named the ‘Coelometer’ by its inventor (£100,000), which can be used for astronomical calculations from the time of sunset anywhere in the world to finding longitude by observing the moon. The improvement of scientific instruments spurred the production of atlases of the skies as well as the earth. The exhibition contains an example of the only celestial atlas published during the Dutch Golden Age, by Andreas Cellarius (£350,000). And while at the moment it is mainly territorial controversies that occupy our attention, the collection provides a reminder of how contentious the heavens can be. A copy of John Senex’s groundbreaking star atlas (£15,000) contains one of the most controversial maps of the century, a star chart. The data used for the chart was published without permission from the astronomer, Nicholas Flamsteed, who responded by buying every copy of the book he could find and burning them. 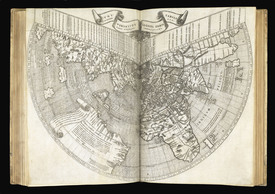 Image: Johann Ruysch’s fan-shaped world map from the third Rome Ptolemy, 1507.